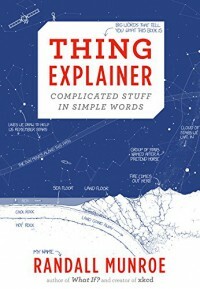 Randall Munroe has an extremely unique style, a blend of humor and simplicity used to explain extremely complicated things. "There's lots of stuff under the front cover of a car. The biggest thing is usually the fire box which turns the wheels to push the car." In this example, Munroe uses a unique blend of comedy and simplistic language to explain something as complex as a car engine. The aforementioned unique style of Munroe, a blend of humor and simplicity, is what makes him extremely popular. This amount of uniqueness sets Munroe apart from all other authors, especially ones who write a similar type of genre. The fact that he is set apart from all other similar authors makes his books enjoyable to say the least.